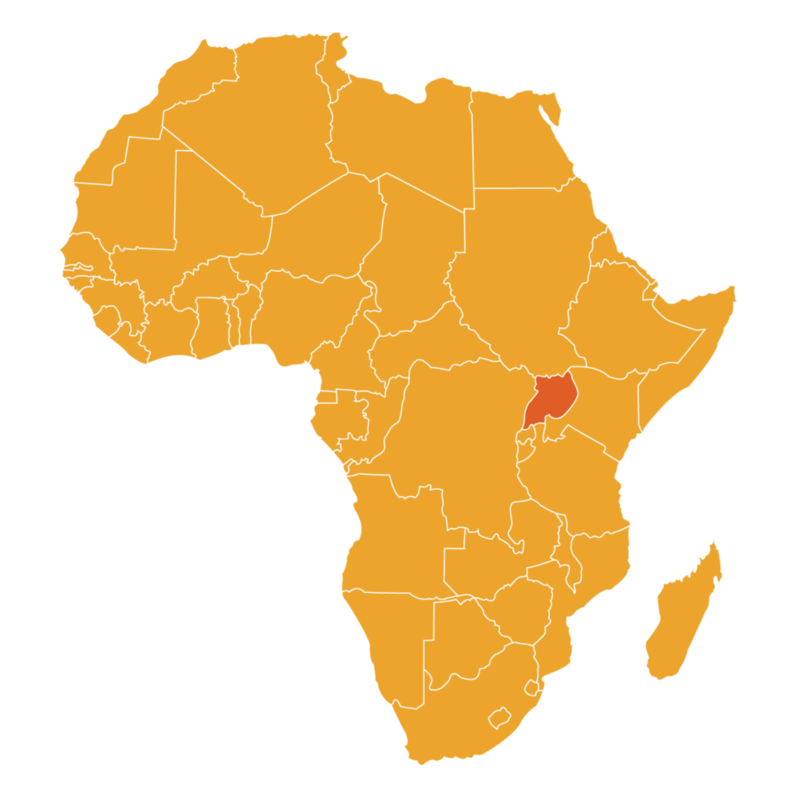 Uganda is an African country that spans 241,038 sq. km, bordering Kenya, South Sudan, Republic of Congo and Rwanda. The country has a population of roughly 35.6 million people and is rich in culture with a variety of ethnic groups, English and Swahili being the two official languages spoken. Since 1894 Uganda had been under British rule, leading up to 1962 when the country finally gained independence. In comparison to Uganda’s neighbouring countries Kenya and Tanzania, Uganda is relatively untouched and often overlooked as a safari destination. Lake Victoria, being the largest freshwater lake in Africa, takes up a large portion of the country, along with four other large lakes and eight major rivers. Uganda contains 10 national parks and there are 60 protected areas within the country, it’s landscape varying from grassland to semi-desert, swampland and forested area. Giraffe, elephant, lion, monkeys, rhino and buffalo are some of the many animals found in Uganda along with a large number of other primates including the endangered Eastern Mountain Gorilla. The Eastern Mountain Gorilla can be found in Bwindi Impenetrable National Park, a park that has been deemed a UNESCO World Heritage Site and a frequently visited tourist destination. The beautiful, untouched scenery, unique wildlife and rich culture make Uganda a prime destination for game viewing as the country slowly continues to make a name for itself. Ready to Travel to Uganda? Bwindi Impenetrable National Park is located in South-western Uganda and is one of the oldest national parks in the country. Over the years the park has expanded in size and evolved from a forest reserve to a designated animal sanctuary and was declared a national park in 1991. In 1994 the park was declared a UNESCO World Heritage Site, acknowledging and protecting its ecological significance. The park’s spectacular biodiversity is incredibly varied as is its staggering elevation, thus Bwindi contains over 1,000 species of flowering plants, and 120 species of different mammals along with a vast array of other flora and fauna. Bwindi Impenetrable Forest is known for its number of primate species and is home to chimpanzees, colobus monkeys and the endangered and extremely rare mountain gorillas. In 1993 the park was open for gorilla tracking and became a popular tourist activity. The two main points in Bwindi Impenetrable National Park where gorilla tracking takes place are the Nkuringo and Buhoma sectors. There are roughly 340 mountain gorillas that exist in Bwindi which accounts for nearly half of the entire mountain gorilla population in the world. Queen Elizabeth National Park is Uganda’s most popular national park, located in the Western Rift Valley. Queen Elizabeth National Park was established in 1952, firstly named as “Kazinga National Park”. The name continued to evolve over the years until it eventually became known as Queen Elizabeth National Park following a visit by Queen Elizabeth II in 1954.The park stretches 1,978 sq. km and consists of a diverse collection of ecosystems and unique geography. The park is unique in its varied landscapes as it consists of grassland, forested area and wetlands and while also hosting the unique features of volcanic formations including craters and cones which can be seen within the park. Many different species of animal exist within the park including elephants, Hons, leopards, hippopotami, chimpanzee and more. Queen Elizabeth National Park is also a bird-watchers delight as the park inhabits over 500 unique bird species. Murchison Falls National Park is the largest national park in Uganda, located in North-western Uganda it stretches 3,893 sq. km and is one of the oldest in the country, having been established in 1952. Collectively, the Murchison Falls Conservation Area is composed of both the Bugungu Wildlife Reserve and the Karuma Wildlife Reserve. The park is divided by the Nile River which runs through its land and is home to the largest crocodile and hippopotami population in Uganda, and one of the largest in all of Africa. Murchison Falls itself is a powerful waterfall consisting of rushing water of the River Nile plunging itself out of a narrow canyon, famous for the formation of a beautiful, spanning rainbow that hangs above it. Murchison Falls National park is Uganda’s only national park that inhabits each game animal to make up “the big five” and is abundant in a variety of species including six species of primate and over 400 unique bird species.